We are one of the foremost manufacturers, suppliers and exporters of Vibrating Sieve. 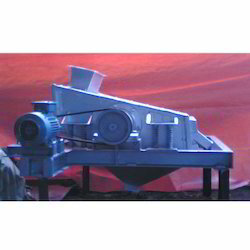 Offered product is widely demanded for the purpose of removing impurities and processing minerals. These products are highly demanded in the international market owing to their durability, simple structure, corrosion resistance and reliable performance. Furthermore, we make these products are packaged using finest quality material in order to ensure their safe transit. Apart from this, we make these products available to the customers in variegated specifications at nominal prices. We are listed amidst the most affluent manufacturers and suppliers of Vibrating Sieve that are fabricated using cutting edge technology and finest quality raw-material. These sieves are widely used in processing technology applications such as food grains and plastics. Our team of experienced professionals check the quality of products to make sure that they adhere to the international quality standards. Ideal for dry sieving and dry separation, these sieves comprise of screens that are rectangular in shape and are bolted inside the rigidly designed body case. Bolted transverse supports are attached to the side plates that are placed along with inclined screen on sturdy screen-rests. Looking for Vibrating Sieve ?